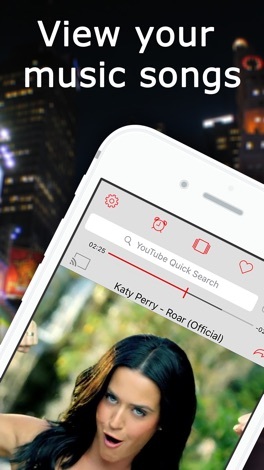 Music TV™ is the only app in the iTunes App Store that automatically scans your iPhone, iPad or iPod touch music library songs and displays the corresponding YouTube video. It’s perfect for parties, or simply for adding fun and flair to a personal entertainment experience. With Music TV you can also add YouTube music videos and playlists to your playlist, so in effect, you have unlimited, access to music video and audio!! - The ability to create custom playlists with songs from your music library or directly from YouTube! - Access your YouTube account and import your playlists directly in Music TV! - Option to filter explicit content: let your kids use Music TV safely! 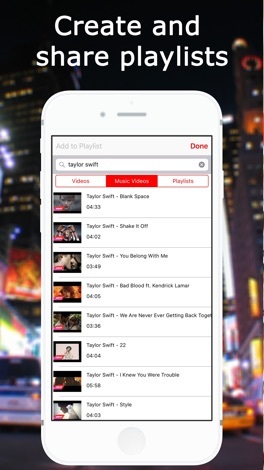 Plus, Music TV features an incredible self-learning algorithm that actually retrieves music videos faster and more accurate as more users enjoy the app. DOWNLOAD MUSIC TV TODAY...and enjoy the feeling of the good old music television channels! NOTE: This app contains an auto-renewable subscription. The payment for the subscription will be charged to your iTunes Account at confirmation of purchase. The subscription provides you unlimited playlists, a sleep timer, and removes all ads. The subscription automatically renews unless auto-renew is turned off at least 24-hours before the end of the current period. Your account will be charged for renewal within 24-hours prior to the end of the current period. Auto-renewal may be turned off by going to the user's Account Settings after purchase. No cancellation of the current subscription is allowed during active subscription period. Any unused portion of a free trial period, if offered, will be forfeited when the user purchases a subscription to that publication, where applicable. 저희가 이메일을 보내드립니다. 반드시 로그인 하십시오. 버튼을 클릭한 후, QR 코드 스캐너를 사용하여 iPhone / iPad 장치로 직접 앱을 다운로드 합니다. © 2019 Appszoom Technologies. 개인정보 보호정책. iPhone은 Apple Inc.의 등록상표입니다.